"Time and tide melt the snowman." 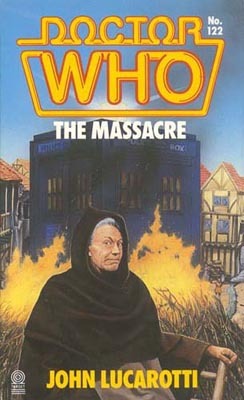 It was all change for Doctor Who in 1987. 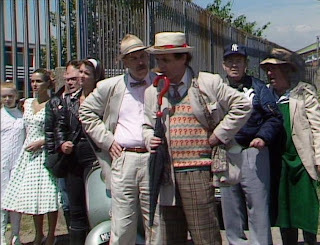 The Seventh Doctor was very different from his predecessor. Gone was the loud, bombastic and supremely confident Sixth Doctor. Instead we had a Doctor who, initially at least, was more of a bumbling fool. Whereas the Sixth Doctor seemed to have a quote for any occasion, the Seventh would often get his words muddled. But behind this apparent foolish persona was a keen intelligence and bravery that all the Doctors possess. As well as changes in front of the camera, there was a change behind the scenes as well. Eric Saward the script editor had left under a cloud during the previous season. His replacement was Andrew Cartmel who had very clear ideas about where he wanted to steer the series. However Cartmel couldn't start putting his plans into action straight away. The first story of Season 24, 'Time and the Rani' had already been commissioned by John Nathan Turner from experienced writers Pip & Jane Baker. The Bakers had a tough assignment: they had to write the introductory story for the new Doctor without (initially at least) knowing who was going to be playing him or what his character was going to be like. To get around this problem they simply wrote the Seventh Doctor as the opposite of his predecessor. This is why, as mentioned above, we have a Doctor h who is less self-assured and getting his words muddled. The title sequence, which exploded into life after the regeneration, was brand new and quite a departure from what we had previously been used to. The theme tune too was radically different, performed by Keff McCulloch, who provided much of the incidental music to this season. When I first heard it, I loathed the new theme but soon grew to love it and it's probably my favourite version of the tune. As well as a new Doctor and a new theme tune, the story also sees the return of old villain. 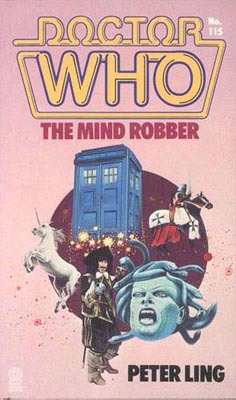 I won't tell you who but the clue is in the title.What's particularly interesting about the Rani here though isn't the revelation that she's growing a giant brain or the fact that she's kidnapped geniuses from across time and space to plug into this giant brain. No,the big news is that the Rani is clearly a Bonnie Langford fan as she happens to keep a red wig and a costume handy for dressing up as Mel. 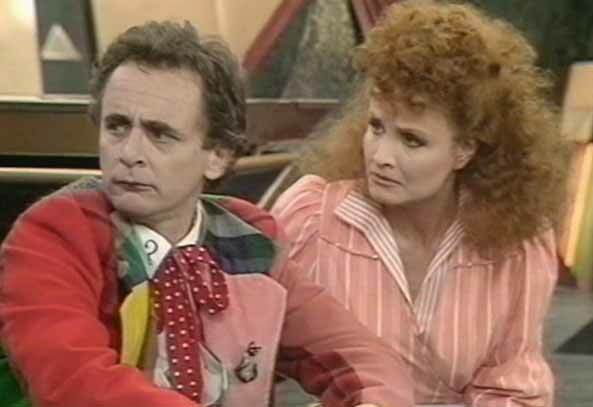 Perhaps the Rani had just been to a Doctor Who convention in costume as everyone's favourite red head. Whatever the reason, the Rani's new found interest in dressing up comes in handy as she attempts to fool the newly-regenerated and confused Doctor into believing that she is Mel. It's a cunning attempt to get the Doctor to unwittingly aid the Rani in her plan. Fortunately the real Mel is on hand to save the day and she and the Doctor destroy the Rani's giant brain. The last we see of the Rani she's trapped in her TARDIS surrounded by her bat-like servants, the Tetraps, who have decided to turn on their Mistress. 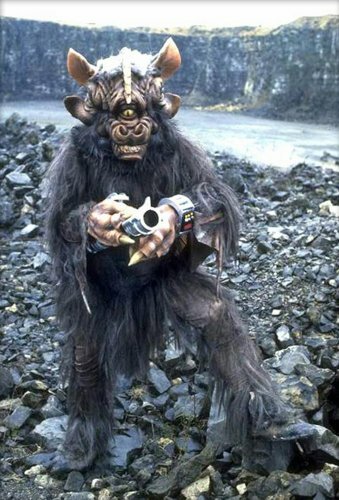 The Rani has never been seen since although there are many fans who feel that she is overdue for a return. The next stop for the new Doctor is 'Paradise Towers'. The Doctor and Mel travel to the Towers looking for a swimming pool to take a dip in. Instead they discover that the Towers in home to a strange type of what could be almost called gang warfare. There a three distinct groups in Paradise Towers. There are the Kangs, young girls who roam the corridors of Paradise Towers. The Kangs are themselves divided into three separate factions: red, yellow and blue Kangs. Then there are the Rezzies, or Residents: a group of mostly elderly women who are, for the most part, trying to live as normally as possible. Although, as Mel discovers, there are one or two Rezzies who have gone a bit 'Hannibal Lectar' and are eating their fellow residents. Finally, there are the Caretakers who are trying to maintain order in Paradise Towers. Sadly they're not doing a good job as the Towers is in a terrible state of disrepair when Mel and the Doctor arrive. 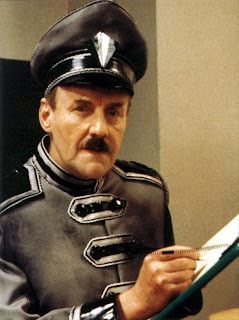 The Cateakers are led by the Chief Caretaker, played by the one and only Richard Briers. The Chief has a few secrets of his own, namely the creature that he keeps locked up in his basement. 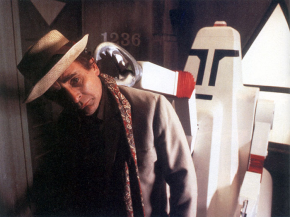 The Chief uses the large robotic Cleaners to capture the hapless residents of Paradise Towers and feed them to his pet, who turns out to be the Great Architect who created the Towers in the first place. The Doctor and Mel have to unite the warring factions of Paradise Towers to combat the Great Architect, who in the end possesses the body of the Chief Caretaker and attempts to destroy everyone. They're helped - and occasionally hindered - by Pardise Towers' last resident - Pex. Pex is a young man who has no ties to any of the warring factions. He simply wants to do what is right. The problem is that he's also a total coward. But his experiences with the Doctor and Mel help to change him and, in the end, he makes the ultimate sacrifice and saves Paradise Towers. After all that, the Doctor and Mel seem in need of a real holiday. Fortunately, at the beginning of the next story 'Delta and the Bannermen', they win one - a trip to Disneyland in 1959. Unfortunately they never actually get there as they and their fellow holidaymakers crash at Shangri-La holiday camp in South Wales. What nobody knows is that an alien princess called Delta is hiding amongst the holidaymakers and she is being hunted down by the ruthless Bannermen. What follows is a bit of a light-hearted run-around as the Doctor, Mel and a rag-tag group of helpers battle to save the princess and her young daughter from the Bannermen all set to the backdrop of 1950s music. The story wasn't all that well received at the time but people seem to be a bit more appreciative of it now. Two little things to note about it. First is the character of Ray, a young Welsh girl who works at the holiday camp. She's a bit of a tomboy who likes motorbikes and spends a lot of the story hanging out with the Doctor. 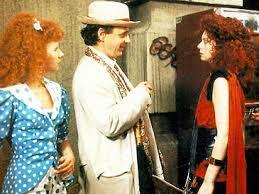 At the time this was being filmed John Nathan-Turner knew that Bonnie Langford would be leaving the series. In looking for a replacement companion he did consider having Ray join the Doctor on his travels but ultimately decided against it. While his decision was probably ultimately for the best, you have to wonder how things could have turned out. The other little thing to note about this story is that comedian Ken Dodd puts in a guest appearance. Fortunately it's not for very long. And so we reach the end of the season: Dragonfire. The story sees the return of Glitz, last seen at the end of Trial of a Time Lord, and the departure of Mel after what seems like no time at all. The setting for Mel's final story is Iceworld which is, of all things, a futuristic shopping centre albeit one with a secret hidden beneath it. There are rumours of a dragon beneath Iceworld that guards an ancient treasure. 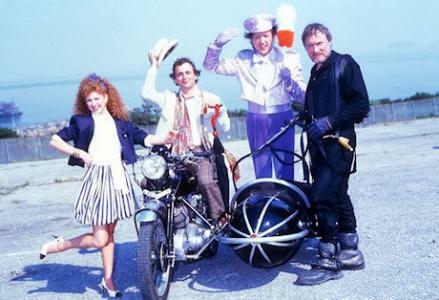 The Doctor, Mel and Glitz go hunting for it accompanied by teenage waitress Ace who has been mysteriously transported across time and space from 1980s Earth. Ace was to be the last companion of the 'Classic' Doctor Who series. She was intended to be a bit different from some of the previous companions in that she was tough, didn't scream and wasn't afraid to stand up to either the Doctor or the various evil villains that she faced. She also had the somewhat annoying habit of referring to the Doctor as 'Professor'. 'Dragonfire' is famous, or infamous, for being the story where the first episode ends with a literal cliffhanger - for no reason other than to provide a cliffhanger. 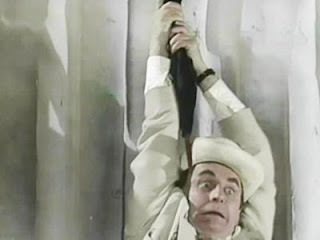 In short, the Doctor is trying to cross an ice ravine and, finding no way across, tries to climb down using his umbrella. The episode ends with the Doctor dangling from his umbrella above a seemingly bottomless pit. This scene was seen briefly in the most recent episode of the new series, 'The Name of the Doctor' as its one of the periods of the Doctor's life that Clara visits. 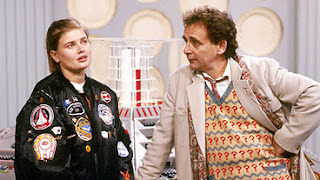 And so it's goodbye to Mel, who goes off with Glitz at the end of the story and hello to Ace who is offered the chance to travel with the Doctor, an offer she seems more than happy to accept. 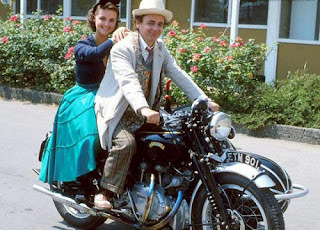 With Ace on board, the TARDIS team for the rest of the original run of the series (and beyond) was complete and the next couple of years would see the series taken in some new and interesting directions. In other video news, the Myth Makers series released their latest interview tape with Sergeant Benton himself, John Levene. They also release 'Myth Runner: The Best and Worst of Myth Makers which pretty much speaks for itself. It was collection of outtakes and bloopers from the Myth Makers videos so far released. Nothing of note was available this year. 1987 was a busy year for the novelisations with eleven books being released this year. With fewer new stories being made for TV there were fewer new stories that needed novelising. This presented an ideal opportunity for Target books to concentrate on novelising those older stories from the Sixties that had, up till now been neglected. The majority of the books released in 1987, then, were stories for the First and Second Doctors. So, for the First Doctor, we had no less than 6 books: 'The Ark', 'The Space Museum', 'The Sensorites', 'The Reign of Terror', 'The Romans', and 'The Massacre'. 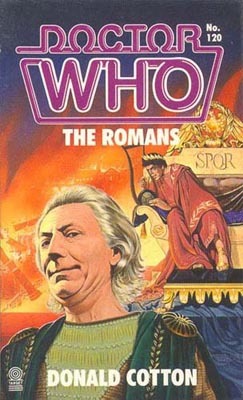 Of particular note here is 'The Romans' which was written by Donald Cotton, who'd previously written the novelisation of 'The Myth Makers'. He chose to write 'The Romans' in the form a collection of letters and diary entries written by the various characters in the story. The Second Doctor had three novelisations to his name: 'The Macra Terror', 'The Mind Robber' and 'The Faceless Ones'. The other two novelisation released this year were Third Doctor adventure 'Ambassadors of Death' and Fifth Doctor tale 'Black Orchid'. Target also released the third and final 'Companions of Doctor Who' book. Unlike the Turlough and Harry Sullivan books released previously this third book was not an original novel. 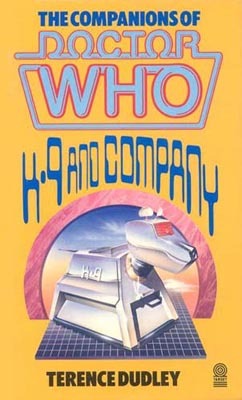 Instead the 1981 spin-off 'K9 and Company' was novelised. In terms of other books, things were a bit thinner on the ground than in recent years. We had yet another coffee table book from the prolific Peter Haining. This one was called The Time-Traveller's Guide and was much like his previous books in format and style. Also released this year was the first part of the 'Encyclopedia of the Worlds of Doctor Who': an ambitious attempt to catalogue the series. 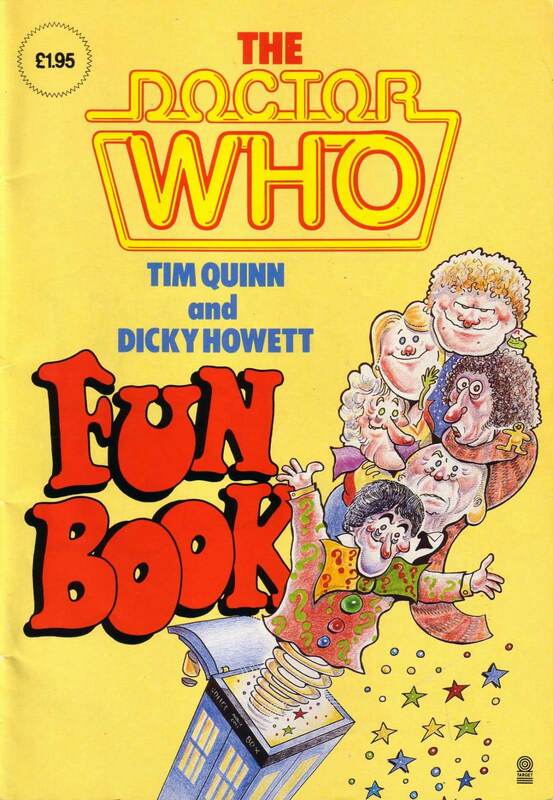 It was intended to be published over four volumes with this first volume covering the letters A-D.
My personal favourite book of the year was the 'Doctor Who Fun Book' by Tim Quinn and Dicky Howett. For the previous few years, Quinn and Howett had been providing funny, short comic strips for the Doctor Who Magazine. Their first book allowed them to expand beyond the narrow confines of their comic strip and come up with some new material that the magazine didn't have the space to accommodate. Put simply, it was really funny and I wish I still had a copy of that book. Colin Baker may have been fired but the Sixth Doctor, along with Peri and Frobisher, lingered on in the comic strip until September 1987. The year opened with 'Profits of Doom' which saw the time travellers on board a space ship that had been invaded by giant slug like creatures who don't do anything unless it there was a profit in it for them. This strip was written by Mike Collins who would become a more regular presence on the comic strip in later years as one of the main artists from the Eighth Doctor's era onwards. Following this strip came 'The Gift' where the Doctor and his friends visit the planet Zazz which has based its society on 1920s America. The people of this planet love nothing more than a good party which is all well and good until some robotic Scavengers crash the party and start destroying everything in their path. The Doctor takes a leaf out of the Pied Piper's book to stop the robots. 'The World Shapers', written by Grant Morrison, marks the end of the Sixth Doctor's era in the comic strip. The story sees the Doctor, Peri and Frobisher visiting the planet Marinus (as seen in 1964's 'Keys of Marinus') and finding it empty of life. Investigating this mystery leads them into travelling to 18th Century Scotland and enlisting the aid of none other than former Second Doctor companion Jamie McCrimmon. However the Jamie they meet is not the young man who travelled with the Doctor. Now he's an old man who's keen to go on one last journey. This story is rather good and is a nice tribute to the TV stories of the Sixties. As well as Marinus and Jamie, we also get the Voord (again from 'The Keys of Marinus'), the Cybermen and even a brief cameo from the Brigadier. Things all come to a head at the climax of the story when Jamie sacrifices himself to save the Doctor. There was little time to mourn Jamie's death or the departure of the Sixth Doctor though. 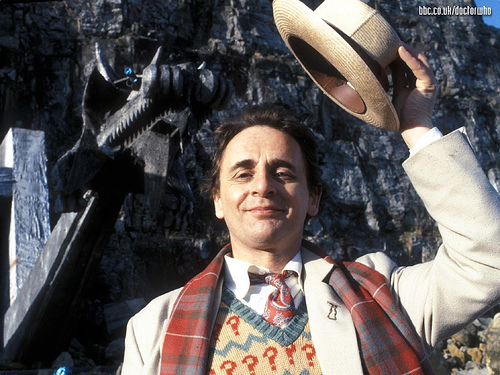 The very next month (October 1987) saw the debut of the Seventh Doctor in the comic strip in 'A Cold Day in Hell'. Peri might also have gone but Frobisher was still there, albeit feeling somewhat glum without Peri. 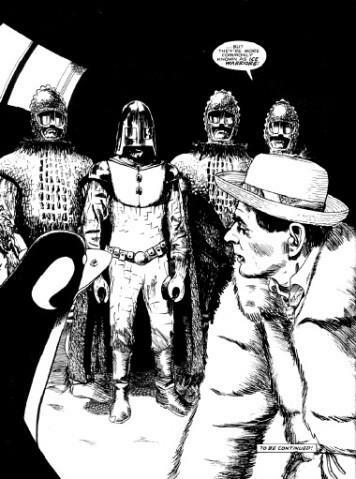 'A Cold Day in Hell' sees the Doctor and Frobisher visit holiday world A-Lux which has been turned from a paradise into a wintry wasteland by the Ice Warriors. The Doctor and Frobisher team up with a group of holidaymakers to warm the planet up and see the Ice Warriors off. With that done, Frobisher chooses to stay behind on the planet to help restore it. Though sorry to see Frobisher leave, the Doctor is not left companionless for long. Olla, an alien woman who feeds off heat, was on the planet when the Ice Warriors arrived and she sees the Doctor as a ticket off the planet. A little reluctantly he agrees to take her along with him. On 28 March 1987, just three days after his 67th birthday, Patrick Troughton died from a massive heart attack. Needless to say, Doctor Who fans were in shock. What was particularly sad was that Troughton died whilst attending a Doctor Who convention in the United States. The Doctor Who Magazine published a tribute issue to Troughton shortly after his death, reflecting on his life and career. 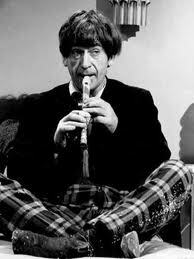 It's easy to forget that, for Troughton, Doctor Who was a relatively small part of his career, just three years out of a much longer career and many, many different roles in both TV and film. Indeed he was still working regularly right up to his death. And yet, despite it being just one job amongst so many, it's obvious that the role of the Doctor was one that he was immensely proud of and he had a great affection for the programme long after he left it. He did, after tall, return to the series on no less than three occasions and, when the series was facing cancellation in 1985, he popped into the production offices and helped man the phones when distraught fans were ringing in, upset at the news. He was also afforded a lot of respect amongst his fellow Doctors. He was good friends with Jon Pertwee, Colin Baker used to refer to him as 'the Guv'nr' and both Sylvester McCoy and Matt Smith have cited him as inspiration for their own takes on the Doctor. Patrick Troughton might be gone but his legacy still lives on to this day.